I was tired last night and fell asleep before I could get round to writing up Saturday’s YAC activities in the graveyard. I hope you can find it in your heart to forgive me. Anyway, I am just back from the Sunday session and will delay no longer. Saturday was busy. A new member, Andrew joined us for the first time, while Morven, one of our leaders, brought her younger brother, Alasdair along to see how he would enjoy himself. Both made excellent starts to their archaeological careers. Experienced members Erin and Algirdas helped to welcome the boys and get them started. We focused on finishing revealing our third stone and better defining the edges of the other two stones, now they are further from the cutting edge. As well as the usual nails, glass and pottery, a number of fragments of electrical wiring were discovered. It is interesting that electrical materials were already being disposed of by 1930, perhaps as parts of demolished buildings? Annoyingly our blank, flat stone hides quite a bit of the standing stone abutting it’s western edge. We can see some badly worn carving, but nothing else. Yet. 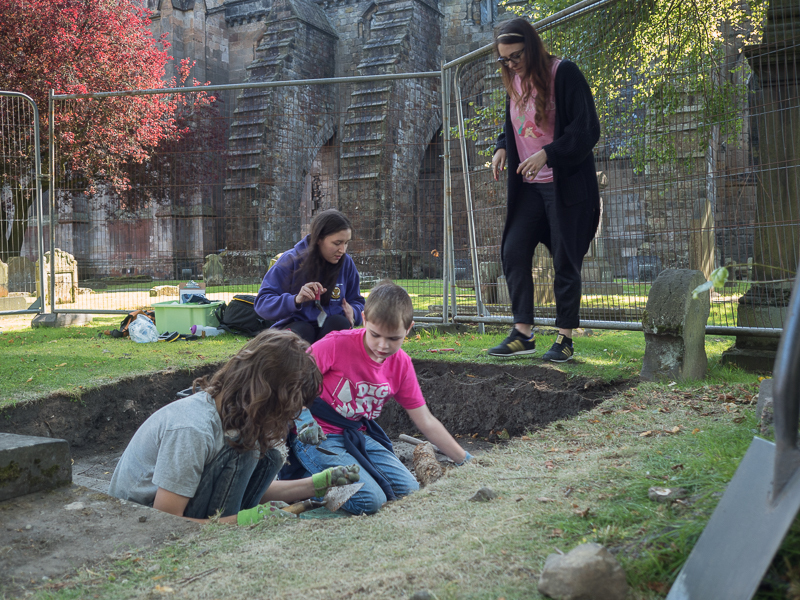 Finally I will just mention the tremendous amount of interest and encouragement our young archaeologists have received from visitors. We are now used to people staring for a while and then walking up to ask what on earth we are doing. 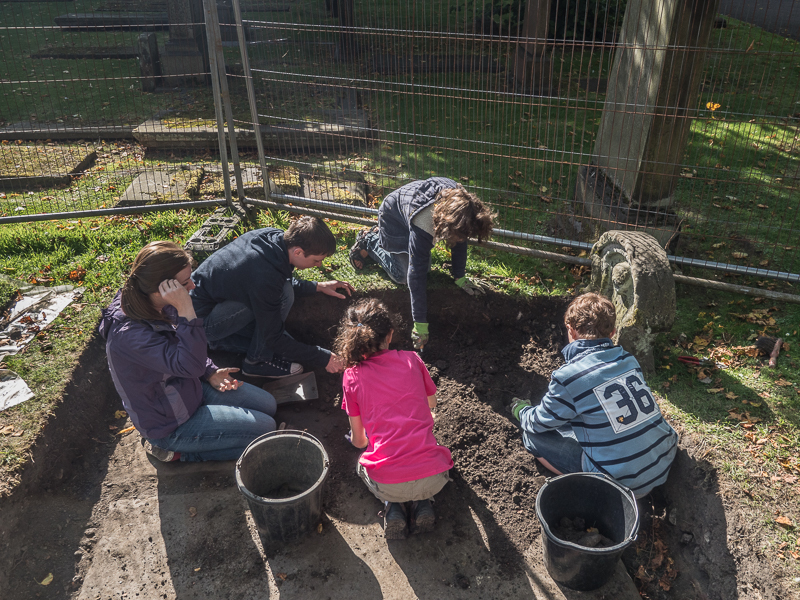 They are always fascinated by the project and impressed at amount the young archaeologists have achieved. more than 60 people of all ages, from all around the world about the project and what has been discovered so far. In fact, we didn’t get as much work done today as we had hoped. That said, there would be little point to the project if we didn’t share our findings with folk who show an interest, and its always a two-way conversation. 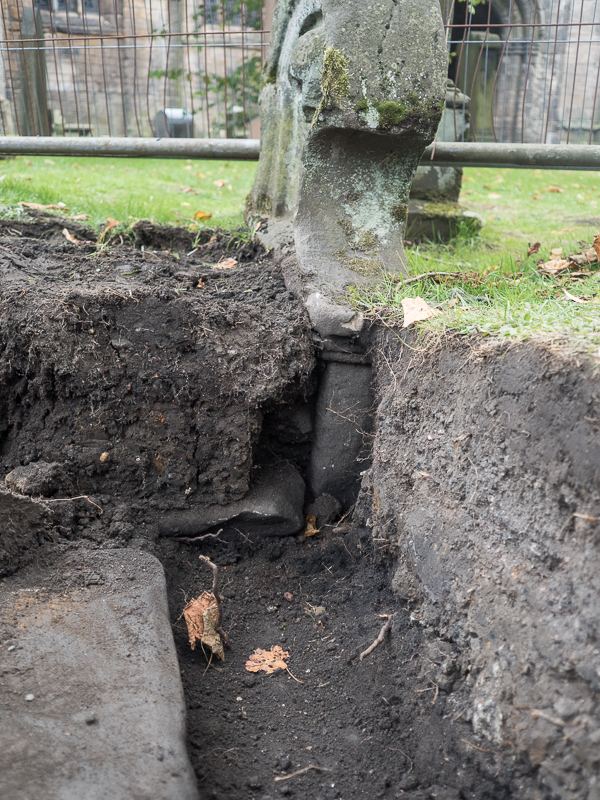 This is the first of a couple of posts that will focus on the small finds we have made in the graveyard over the last couple of weeks. First, I should say that we have come across a few fragments of human bone. These are always treated with respect and returned to the ground immediately. Probably the most moving find was the rib of a small child that had clearly suffered from rickets, and therefore malnutrition during its short life. Apparently such stray finds, probably from the 19th or early 20th centuries are not uncommon. 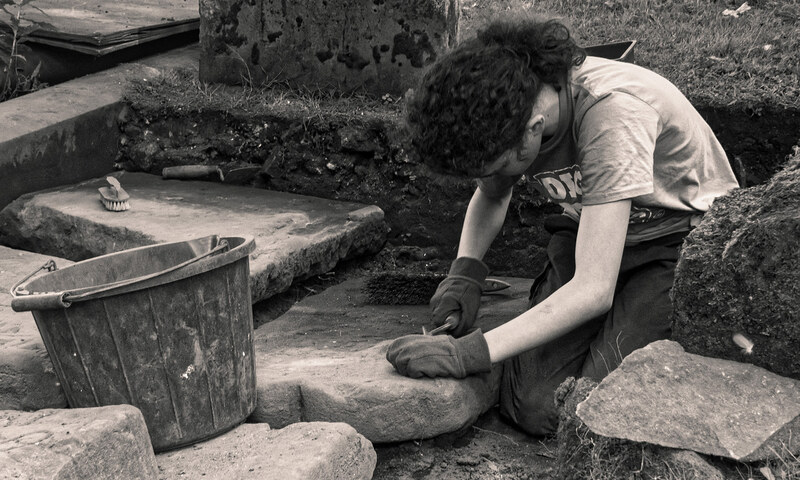 Most finds come from the layer of early 20th century rubbish that was spread over the parts of the graveyard in 1930 to level the ground and prevent flooding. A fair number of well rusted iron and other metallic objects have turned up. We are starting to gather quite a collection of substantial nails such as these. During the 19th century it became common for nails to be cut from sheets of iron (hence “cut nails”). However, the nail heads were often made to look exactly the same as earlier, hand wrought nails. By the early 20th century many nails were made from wire, as they are today and so look much like modern nails. 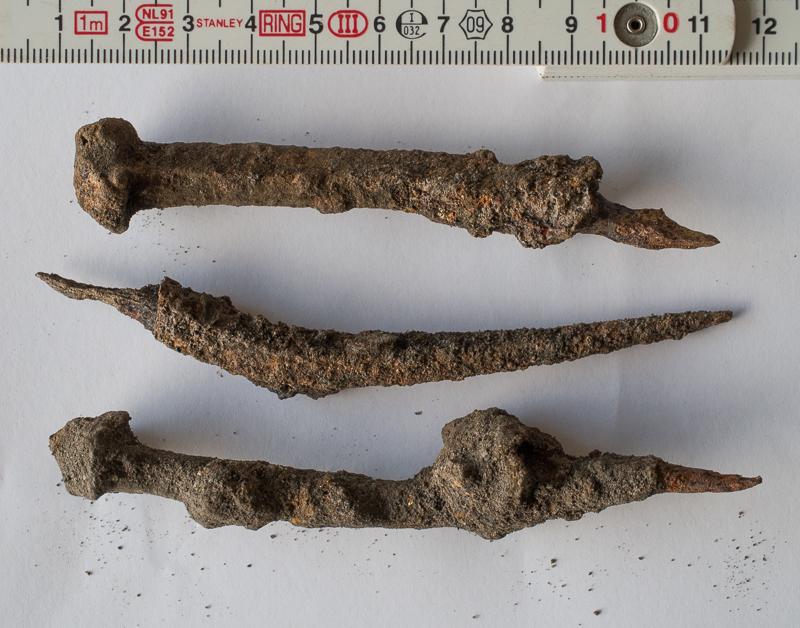 These are clearly not wire nails, so they were most likely used in older buildings, perhaps demolished in the early 20th century. The coronation was that of Queen Victoria’s son, Edward VII, and sure enough there is a rather worn and unflattering portrait of him on the other side of the bowl. We have also found a few fragments of what is probably the stems of old clay pipes. Pipes were prone to breaking and by the turn of the century were losing out in popularity to cigarettes. Another finds focused post will follow later in the week (if I find the time). third stone in the south side of the trench, while I just watched or chatted to visitors, apparently. There is no sign of inscription on the new stone yet, but it is still very mucky, and we haven’t given up hope yet. You can see from the photo below that the flat stone is hard up against the standing stone at the west end of the trench and may well obscure at least part of any inscription that remains. We just hope that we can at least see a name on the stone. There is still plenty to do next weekend. 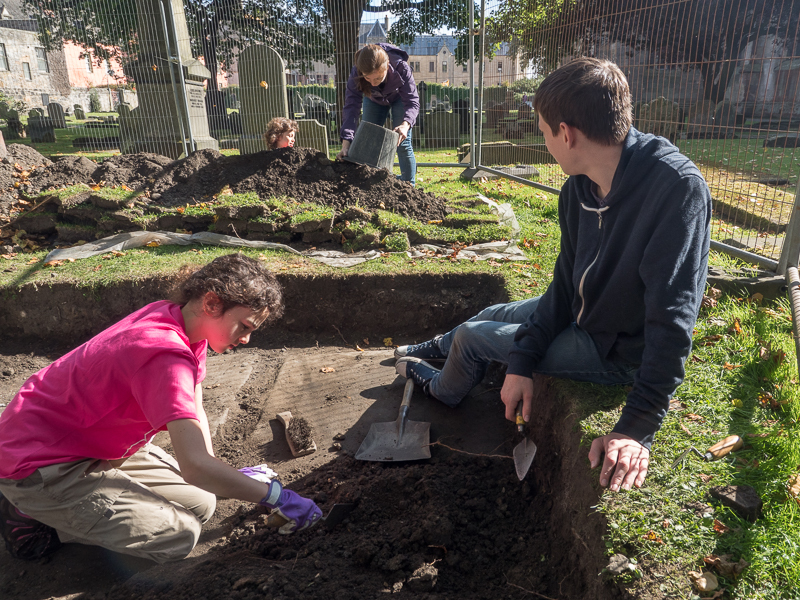 Finlay and Algirdas came to work in the YAC trench for a couple of hours this afternoon. 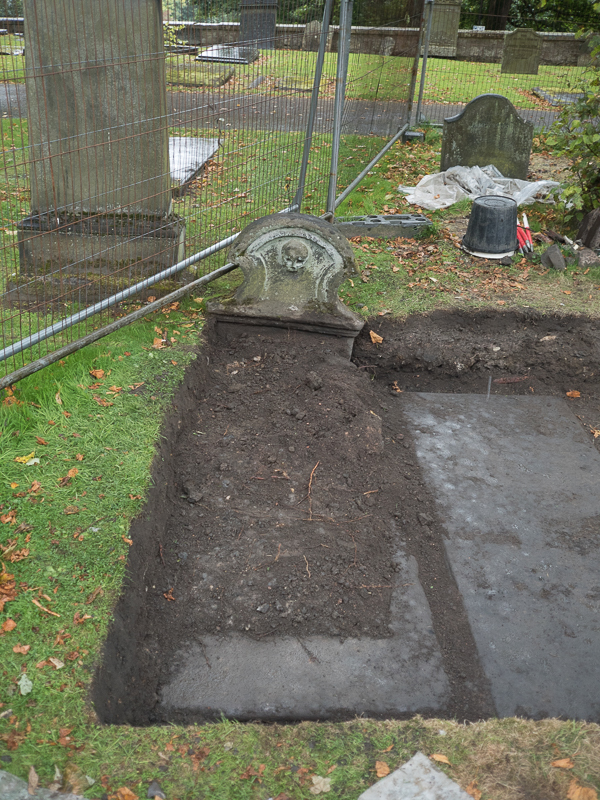 We wanted to extend the trench further west to reveal the ends of the stones already exposed and also to the south so we could investigate the standing gravestone just south of the trench. The west end of the trench proved tougher than we had expected. Sheltered by a nearby tree, the soil was dry, hard-packed and full of stone. It took a lot of effort to clear. 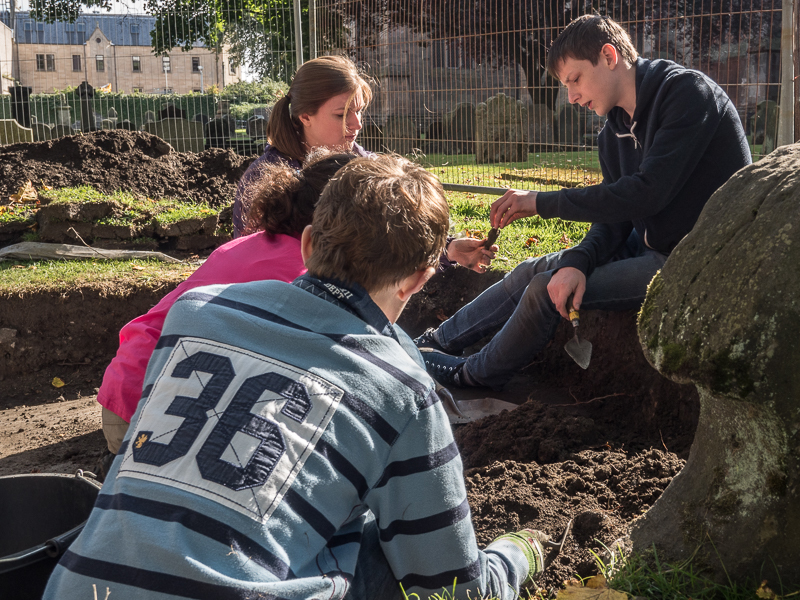 The boys and Charlotte focused on this side of the trench and only began to reveal the buried portion of the standing gravestone at the end of the session. 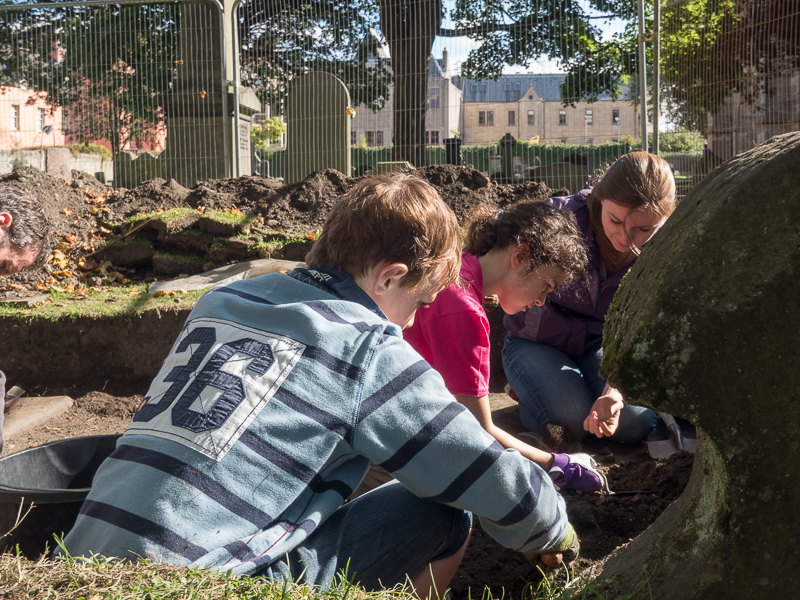 They succeeded in uncovering the rest of the gravestones at the bottom of the trench. Meanwhile, Iona, a YAC leader, worked quietly away on the south east corner of the trench, where the going was much easier. She soon found the edge of yet another gravestone. The boys switched over for the last ten minutes of the session to help to expose a bit more of the new stone. So far it looks very similar to its neighbours; the next in a row of gravestones. It most likely continues right up to standing gravestone that we are so interested in. The big question of course is does it have an inscription? We will have to extend the trench yet again to answer that question. One or two interesting finds were made during the afternoon, which I think I’ll save for another post during the week.